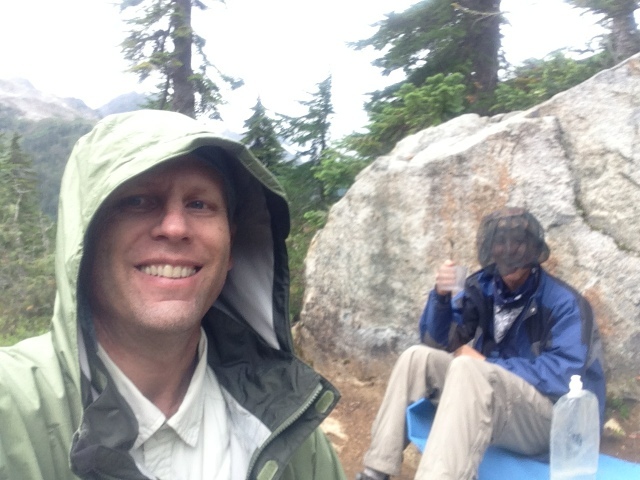 Use one word to describe North Cascades National Park - rain! It's been raining off and on for the last half of the day. It really became intense right in the middle of dinner. We had made plans to hike in and over Hannegan Pass and camp at Boundary Camp. When we arrived at the ranger station and began speaking with the ranger we learned that our plan was not going to work out. The ranger helped us create a new plan. 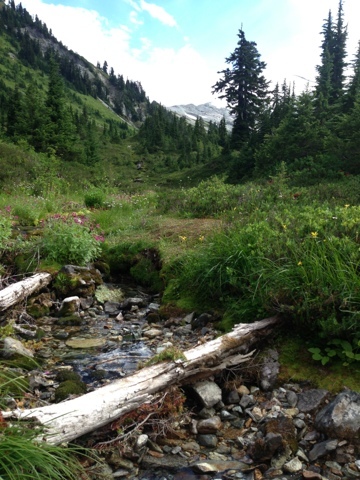 The new plan has us camping at Hannegan camp on the west side of the pass. We arrived at camp around two thirty and decided to try to climb Ruth Mountain. We started up the trail to the pass after setting up our tent and hanging our food at around three o'clock. 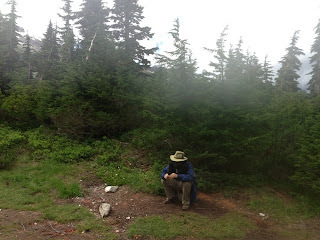 We actually made the observation that if it should rain the water might drain down the trail into our tent. We ignored our own observation so by the time we decided to get out of the rain after dinner, we had a creek running under our tent. Fortunately we have brought the three man tent and it has a floor in it. This means that the water was running under our tent and not through it. We used our ice axes to dig a Boy Scout trench to divert to water around the tent. We are all dry, mostly dry anyway and warm in the tent as the rain continues to fall in fits and starts. Every now and again the wind picks up and blows the rain around.